I missed the two tornadoes in southern Nebraska and the area I thought had the higher tornado risk had none. Of course, I have mixed feelings about this. From a societal standpoint, I'm very happy there were fewer tornadoes with no one hurt. From a forecaster point of view, my ego is bruised. What happened? I'm not sure, but I will share my speculation. The thunderstorms developed almost exactly where I forecast them. I've circled the thunderstorms in yellow. W = Wichita. Compare the thunderstorms to the "higher risk" area on the map above. However, there were so many thunderstorms earlier in the day, they laid down five boundaries (arrows). 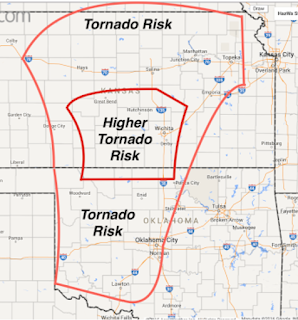 Usually, a single boundary can actually enhance the chance of a tornado developing. 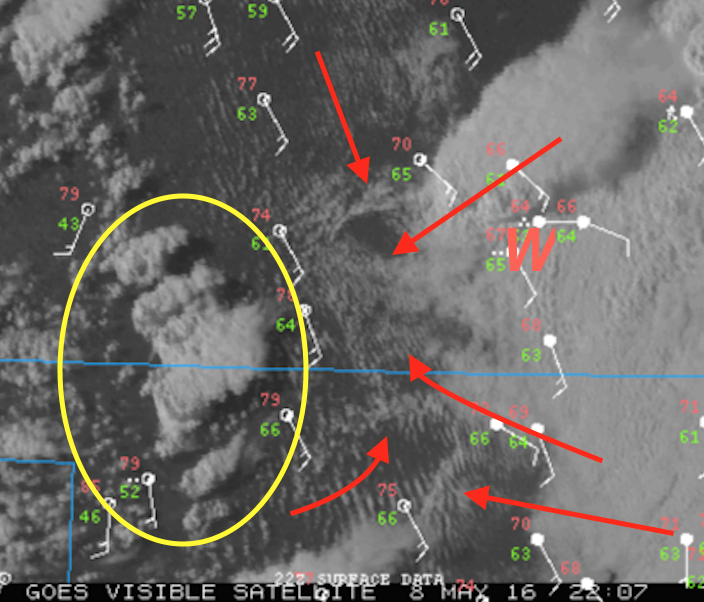 In this case, there were so many boundaries the thunderstorms could not get the moisture and instability they needed to fully develop and rotate. What is a "boundary"? A zone where there is a wind shift, rapid change in temperature or rapid change in moisture. They can usually, but not always, be seen in satellite imagery. So, you missed one. Fortunately, no one suffered any harm except your ego. Do better today. Not the end of the world. I'd rather be alert and have nothing happen than to be surprised and unprepared. People need to realize that when conditions are favorable for severe weather or tornadoes, it won't always happen, but we still need to be prepared. You do a great job Mike. I compared the two maps and it looks like you did fine. 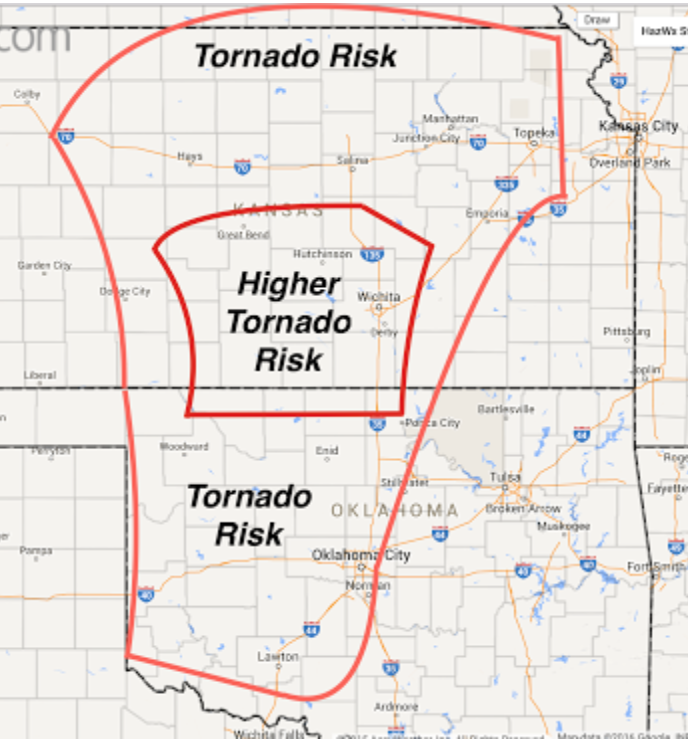 I'm not worried about the higher risk area and if the two tornadoes up top were off your map, they weren't off by much. Maybe you can put the red dots on the top map for us and we can see more clearly how the forecast verified. What time did the tornadoes occur. A forecast made in the morning needs to be updated as new info comes in. If that was a morning forecast and the tornadoes were later on in the day, I'd say it was fine. Have a nice day.